He had nothing to worry about in the packed Ardmore Music Hall Saturday night. The house had been warmed up by Philly’s own Kuf Knotz with harpist/singer Christine Elise and George Stanford of Townhall. Two disparate acts at the top of their games. During the warmup, Wyclef was spotted in the back corner with a hoodie covering his head and behind sunglasses watching the crowd. On cue, he took the stage with “Ready or Not”, dressed in black with his signature hoodie and a “Warrior” hat. The hat became a prop as he turned it to different sides throughout the song, posing for the crowd. There were a number of covers in the set, including two Bob Marley numbers: “No Woman, No Cry” and “Redemption Song.” The tour is in support of his third installment of Carnival but was packed with career-spanning tunes. 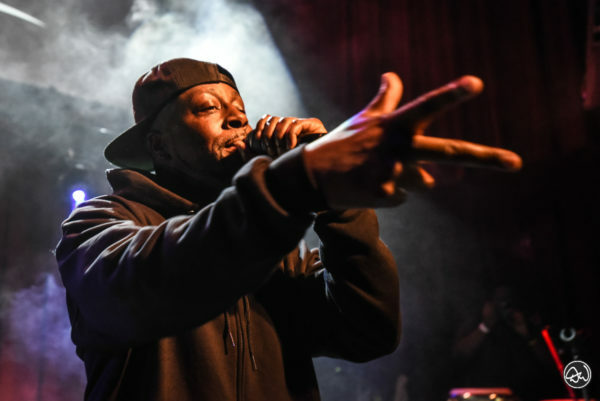 Early in the show, Wyclef set the stage for the night that the performance would flow as if everyone was in the studio and that anything could happen. He instructed the DJ to play the Santana parts of the hit “Maria Maria” and the house sang every note. And that’s how the evening progressed. More than half of the set list was packed with covers and homages to other artists. A humorous medley early on was a mash-up of “If I Was President” and “Knocking on Heaven’s Door.” The choice had a double meaning. He took a few swipes at U.S. President Trump, but the tune reminds that in 2010, Wyclef Jean ran for President of his homeland, Haiti. Despite strong support, officials disqualified him from the race for residency reasons. Now 48 years old, Wyclef proved he still has a very diverse following and plenty of energy and charisma left in the tank. Many were pleasantly surprised to find him in a club as intimate as the Ardmore. It was a rare and pleasant experience for all to be so close to the star. 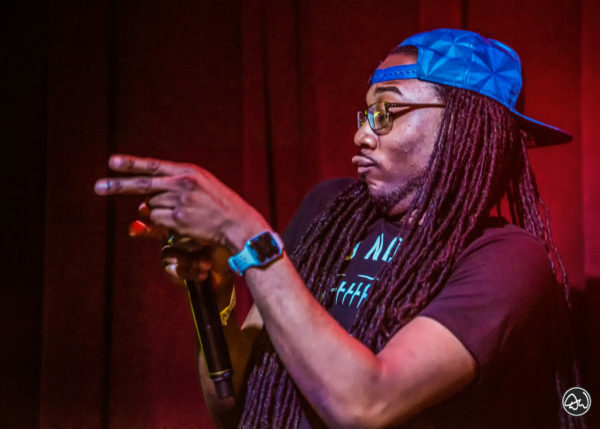 Opening for Wyclef was ever-popular Philly native and rapper Kuf Knotz. I’ve seen Knotz perform a number of times in the past and he oftentimes brings a unique spin to the genre with collaborators, including this night. Backed by the Trap Rabbit band, Kuf introduced harpist/singer Christine Elise as his duet partner for the evening. Reminiscent of Eminem’s duet with Dido on “Stan,” Elise offered an exciting sung counterpoint to the rhymes with her engaging soprano. They were visually interesting as well. Knotz in street camo with his customary braids piled high and Elise in a colorful feminine 60’s inspired full-length print dress and conservative hairstyle. They performed a six-song set with “Soul Music” satisfying the audience as an impromptu sing-along. George Stanford, also of Philly, took the stage with a fine set of classic rock inspired tunes and a hot band behind him. The set of originals were a complete departure from what was otherwise an evening of hip hop. The audience was polite, but a little restless during his excellent performance. 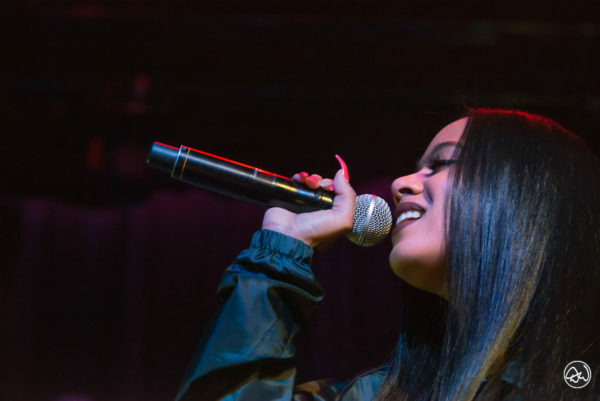 Finally, before Wyclef took the stage, newcomer “Jazzy” brought the evening back to the expected genre with a handful of soulful hip hop tunes. No fear of a cold stage here. The place was hot!